If you haven’t already taken a moment to thank a Veteran today, don’t forget to acknowledge these individuals who have served, or still serving, on active duty or in the reserves. If you typically think of “Vets” as your WWII-era grandfather or your elderly uncle, you might be surprised to learn nearly 60% of male US Veterans are under the age of 65 and over 68% of female US Veterans are under 54! There are hundreds of career paths offered by the Military, and many of these careers provide the preparation needed for a satisfying private sector career. • On-the-job-training (OJT) and Apprenticeship Programs focused on placing vets into trades or skilled jobs. Veterans need to become skilled at showing their assets – their transferable skills and abilities – to future employers. 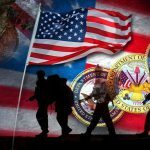 With the help of groups like the National Association of State Approving Agencies, employers ranging from Edward Jones to Chevron to Mattel are now providing Vets with career training which incorporates skills learned while serving on active duty. So, on this day which honors the service of all Military members, take a moment to understand the unique challenges of careers which begin with Military service. We can all learn a little about transferable skills and showing future employers our best assets!